Early this morning, customers who came to buy winter storage cabbages lined up. In the busy year, Xiao Li became Lao Li (left). On the 7th of November, Lidong, the cabbage is rooted on the roots, and the family eats hot dumplings. This is the old Beijing. It’s time to buy winter storage, this year is not to order some cabbage, too much, there are so many, and my heart is good. Buying winter storage vegetables has long since become a habit from the season, even a little ritual. At 5 o’clock in the morning, the sky was unclear, and the winter storage dish that was transported to the Chongwenmen market in the evening was unloaded. At 8 o’clock, the old people who came to buy cabbage and green onions lined up and queued from the door of the market to the parking lot more than ten meters away. 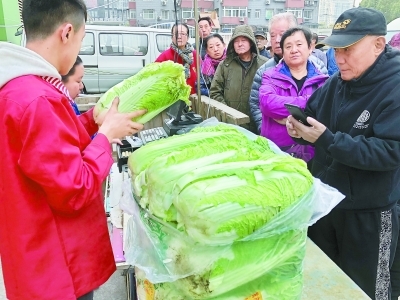 “Buy two cabbages to pickle up.” With the help of Master Li, the old man said to his wife while he was paying for it. After weighing the weight, Master Li turned back and asked: “Aunt, have you got two? I will put this in your pocket.” Every year before and after the winter, this is a common scene in the Chongwenmen market. Only in recent years, the old people who come to buy winter storage vegetables will sigh, the winter storage is not as hot as it used to be, but there are still sales points at the door. Among the old people who lined up, there lived nearby, and there was a little further away. The vegetable market was located at the Guangqumen Bridge. 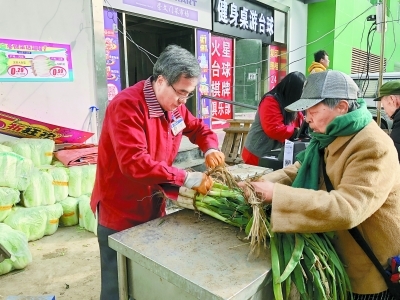 There were not many elderly people who came from Tiantan and Jinsong to buy winter storage. The reporter visited a number of winter store sales points. Compared with the past few years, the elderly who push carts and ride three rounds to pull vegetables have been rare. For many elderly people, buying winter storage vegetables has become a matter of “carrying hands” after shopping in the supermarket. When you see it, you still have to buy two trees habitually. “I can’t take too much, I buy one or two trees at a time, and I have already smashed six trees until now.” An aunt who lined up and an old sister behind him chanted.